Channah Rock - Channah Rock, Ph.D.
Dr. Channah Rock has had a fair amount of experience researching water quality and water treatment methods over the years. Her interest in this field peaked when she volunteered at an environmental microbiology laboratory that was investigating protozoan pathogens in surface waters. 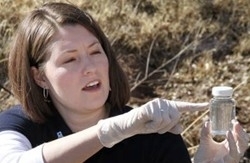 As water quality extension specialist and assistant professor for the Department of Soil, Water, and Environmental Science at the University of Arizona, Dr. Rock utilizes her background in both microbiology and civil and environmental engineering to better understand how pathogens and indicators survive through water treatment and what factors can affect their persistence in the environment. What led you on your path of degrees in your field of science? I started my education in microbiology because I was fascinated about the life of microbes, especially how they survive in the environment and their effect on human health. During my time as an undergraduate, I had the opportunity to volunteer in an environmental microbiology laboratory investigating the protozoan pathogen Cryptosporidium in surface waters across the nation. This amplified my interest in water quality and environmental microbiology. When I decided to continue my education into graduate school, I quickly learned that the environmental microbiology research community is a small, close-knit group of faculty originating from a handful of research programs across the U.S. The programs headed by Dr. Charles Gerba and Dr. Mark Sobsey were a few that stood out to me. I looked into four or five research groups that focused on environmental microbiology and ended up choosing to work with Dr. Morteza Abbaszadegan at Arizona State University. He is a premier scientist in environmental pathogens and is housed in the Department of Civil and Environmental Engineering at ASU. While at ASU, I investigated new cultural and molecular technologies to detect pathogens in biosolids. By having degrees in both microbiology and civil and environmental engineering, I have the background to better understand how pathogens and indicators survive through water treatment and what factors can affect their persistence in the environment. This knowledge also allows me to incorporate new detection techniques as well as generate potential treatment and mitigation technologies from the water treatment community to the food safety arena. While working at the Arizona Cooperative Extension, I was asked to help in some investigations related to water quality, microbiology, and food safety. We have been getting a lot of questions from growers and try to provide the best information we can. I am relatively new to the food safety arena, but it has been really exciting. We have been very successful in receiving funding and grants, which allows us to make a difference in providing helpful information to the produce industry. My collaborators at the Yuma Agricultural Center talked about the Center for Produce Safety and the successes they had in funding research. We agreed it was something worth looking into. We have been applying to CPS for over two years. I attended my first CPS symposium this year in Davis, where I had a research poster. I had the opportunity to interact with the participants and I had a great experience. In 2011, CPS funded your project “Assessment of E. coli as an Indicator of Microbial Quality of Irrigation Waters Use for Produce.” Are there any recent updates from this project? This is a one year project and we are scheduled to end December, 2012. We are trying to investigate different methods used by labs and researchers to examine E.coli. We are looking for the different levels of E.coli and figuring out which of these current methods are the most accurate. We are testing three different methods and what we have found so far is that there is a huge range in accuracy for both false positive rates and false negative rates. At the end of this project, we will be able to provide recommendations on which methods work the best for different types of water or water quality. We have collected 200 to 300 samples from the Arizona and California irrigation systems. We have studied roughly 200 isolates of bacteria molecularly by looking at the DNA. All this data will eventually feed into a risk assessment model. What do you think the industry will gain from your research? Our end goal (beyond this one project) is to help growers make educated decisions about their water sources and quality related to risk. Ultimately, our goal is to provide the tools growers need to be able to keep consumers safe. To do this, growers need to make informed decisions without necessarily relying on Extension. What changes do you see the field of food safety research making during the next 5 years? I am relatively new to this field so I am trying to figure out where food safety has been in the past and where it will be going in the future. I think there is going to be more enhanced tracking systems for water, soil, and product. I think a lot of the power is going to be in the growers’ hands to make these decisions. There is so much data that is being collected across Arizona, California, and the nation from growers. More people are beginning to understand this data and they are better utilizing it to implement future improvements in risk management. What are the key factors influencing your field of inquiry? There have been advancements in different methodologies that food safety scientists, research laboratories, and certified labs are using; which has been a great help for the industry and for us as scientists. However, as with anything that is new, we need to understand what those results mean. Our job is to try to better understand these new technologies and figure out which, if any, are beneficial. I have a lab at the Maricopa Agricultural Center, which is 90 miles north of the University of Arizona; we are basically a working farm. I am a little bit different since I am a water quality specialist and the other folks at the Center are irrigation specialists, pest management, or cropping system scientists. My lab consists of four or five students, a lab manager, and on occasion, visiting scholars from Brazil. A typical day for me begins with a visit with my students, where everyone gets updated on current projects. I try to help them out with whatever they are working on. As much as I would like to be in the lab all the time, I am unfortunately now confined to my office writing grants, papers or working on data analysis. What are your interests outside of your field of study? Since I am going through the tenure process and I just submitted my promotions packet, the spare time I had was dedicated to putting my packet together. However, if I am not here at the lab or in my office working, my husband and I have two big dogs that keep us busy. We have a Great Dane and an English Mastiff that weigh 150 pounds each and they often drag me down the street. Describe one of your career highlights. I was excited to get this job with Cooperative Extension of the University of Arizona. Like most scientists, I get really excited about the science. This job has allowed me to look beyond the science and interact with growers, other stakeholders, and people in many different areas from across the nation. One highlight came this summer when I accepted the Achievement Award for Excellence in Extension Service Educational Programs from the National Association of County Agricultural Agents. This was the first time I have received a national award.